Have you ever felt overwhelmed and just wanted to be held? You’re not alone. Being hugged and held helps your body process what you’re feeling because it releases serotonin, which helps your nervous system calm down. If you feel the overwhelming need to be held on a regular basis, you might benefit from a weighted blanket. Here’s a complete guide to the best weighted blankets for adults on the market. We also have guides sizing and buying weighted blankets for kids! A weighted blanket is a blanket designed to be heavy enough to provide deep touch pressure (DTP) otherwise known as Deep Pressure Therapy, a strategy used by occupational therapists to create a hugging or holding sensation for who struggle with sensory integration. The weighted blanket applies deep touch pressure to the person wearing it. By applying this pressure, the blanket helps release serotonin in the brain. In this case, the release of serotonin helps the blanket wearer deal with sensory disorders by using the serotonin to calm their nervous system and help them relax. Weighted blankets are occupational therapy tools, but many look just like a normal blanket and come in many different sizes, weights, and materials. They can be purchased from online retailers, therapists, or directly from the manufacturers everyday blanket. Why Should I Buy a Weighted Blanket? Weighted blankets provide relief to those dealing with sensory disorders. They’re a safe, natural, and effective way to relax during times of stress. More importantly, weighted blankets are an effective form of Deep Pressure Therapy. A 2008 study of weighted blankets found that adult participants who used a 30-lb weighted blanket reported lower anxiety, lower blood pressure and pulse rate, and an increase in positive calming feelings. Weighted blankets can be used to help people with several mental health diagnoses like ADHD, anxiety, post-traumatic stress disorder (PTSD), and obsessive compulsive disorder (OCD). A weighted blanket is a cuddly blanket, but it’s also a therapy tool. To get the most benefit from one of these tools, it’s important to buy the correct type of blanket. Occupational therapists recommend buying a blanket weighing between 5-10% of the wearer’s body weight. So, if you weigh between 130 and 150 pounds, the best weighted blanket would weigh between 10 and 16 pounds. If you weigh 200 pounds, the best weighted blanket would range between 12 and 22 pounds. Other considerations include the type of material used to make the blanket – it’s important to enjoy the material so that the blanket can provide more relaxation. Weighted blankets also come in different sizes, so you’ll want to consider whether the blanket will be used for sleeping, cuddling, or as a lap blanket before purchasing a blanket. Below, we’ve chosen a few of the better products out there and will discuss the features you’ll be interested in. ULTRA-LUXURIOUS MINKY FABRIC COVER- Outer cover is silky soft on one side while the opposite side features our unique SensaCool Dot(tm) System that helps keeps users cool. Completely reversible. Unlike most weighted blankets with highly noticeable lumpy, square pocket stitching, the Calmforter features a completely uniform, appearance since the entire weighting system is hidden inside the cover. 2 PART CONSTRUCTION FOR EASY WASHING AND LONG LIFE- The outer cover easily zips apart for fast, easy washing and quick drying. No need to wash the entire blanket like old-style 1 piece blankets that take forever to dry and deteriorate quickly as the weights are repeatedly washed. PRICE INCLUDES COVER! NOTE: Most blankets sold today by Chinese sellers do not include a cover. GENEROUS 60" x 80" DIMENSION. Don't end up with an undersized blanket! Studies show that a 60" x 80" size is the ideal dimension to provide full-time, full-body benefits as you sleep. The XL dimension prevents the blanket from sliding off the body as you move in bed. DESIGNED IN THE USA by a team of Healthcare Professionals. As Chinese sellers flood the market we are proud to be Designed in the USA, Stocked in the USA and Serviced in the USA by our team of dedicated professionals located in Orlando, FL. The Original Calmforter- THE WORLDS FIRST AND STILL #1 PREMIUM WEIGHTED BLANKET. Platinum Health’s Calmforter is a 12-pound weighted blanket in an XL size (80” x 60”) suitable for cuddling with or settling in for the night. One side of the blanket cover is made with Minky fabric, which is soft to the touch with a silky relaxing feel. The other side of the blanket is patterned with Natural Health’s Sensadot texture and includes little dots covering the sides, perfect for those who need something to fidget with to relax or go to sleep. The blanket cover can be easily removed to wash and dry, alleviating the need to wash the entire blanket and wait hours or days for it to dry. The Calmforter comes in four different colors: blue/green, purple/gray, pink/gray, and coffee/cream. The trendy colors provide a look that helps disguise the therapeutic look of the average weighted blanket, making it perfect for travel to sleepovers or when visiting friends and family. Platinum Health fills the blankets with what they call CloudSoft Polyfill and Stardust Microbeads to provide a weighting system that looks less lumpy or square than other blankets. Although the blanket is weighted at 12 pounds, it is adjustable. Kids who don’t need the full weight can use half the blanket and adults who want more pressure can use the extra-large size to double up the pressure. A Removable Duvet Cover is Highly Recommended for Easier Cleaning. Please Search Hypnoser Duvet Cover to Find Correponding Cover for Hypnoser Weighted Blanket. Purchase Together to Have a Discount. Cover and inner layer are SOLD SEPERATLY. Choose the blanket that weighs about 10% of your body weight plus one, 15 lbs weight is intended for individuals weighing 100 - 150 lbs. A weighted blanket is supposed to on the top of the mattress and should not go over the edges of bed; when using with children or seniors, ensure the individual has enough strength to move the blanket off themselves if necessary. PREMIUM MATERIAL - The Hypnoser weighted blanket is made of 100% breathable natural cotton, which would make it cooler and more durable than normal blanket. The filling is environmental non-glue polyester padding and Hypo-allergenic,non-toxic,odorless Glass Beads. A SPECIAL TECHNOLOGY:much smaller pocket, which would make weight distributed evenly inside the blanket.Glass beads don't move massive around inside the blanket.Smaller pockets better weight distributed. The Hypnoser Weighted Blanket comes in a variety of sizes making it suitable for adults or children. In fact, it comes in some of the more uncommon sizes such as 30” x 40” and weighing 5 pounds or 60” x 80” and weighing 25 pounds. While most comforters and blankets – weighted or not – are stitched with a box pattern to keep the filling in place, the Hypnoser blanket includes a more attractive diamond pattern. This diamond pattern both keeps the filling in place and disguises the blanket’s therapeutic use, making it ideal for traveling. The weighted blanket and the cover are sold separately, but it’s worthwhile to protect your investment from spills and wear and tear by purchasing the cover. The blanket cover is removable with an easy-to-use zipper and is made of organic cotton or microfiber, making it comfortable even for those with touch issues. Both the cover and the inner weighted layer are suitable for machine wash. The Magic Blanket’s version of a weighted blanket is different from the comforter or duvet styles offered by other manufacturers in that it more closely resembles a throw blanket. The chenille version is made without any stitching, which completely disguises its purpose. Visitors who see it laid out across a sofa will likely have no idea it’s a therapy blanket. The Magic Blanket is made in the United States and has been producing blankets in the U.S. since 1998. It’s become so famous that it has been featured in many national publications like Forbes and Dr. Oz. 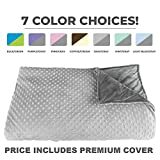 This weighted blanket is available in five colors: champagne, chocolate, lavender, navy blue, and silver grey. It’s also available in various sizes including non-traditional sizing. Sizes range from 24” x 30” (4 pounds) to 54” x 78” (24 pounds). They also include an option to buy larger blankets without the heavier weight such as the 42” x 78” (10 pounds) or the 54” x 78” (14 pounds), so those who want a larger blanket for sleeping but who don’t want to sleep with a heavy weight still have options. These options are also more suitable for children or teenagers whose blankets should not weigh more than 10% of their body weight. MADE IN THE USA! DETERMINE HOW MUCH WEIGHT YOU LIKE-Do you pile several heavy blankets on yourself to achieve a level of comfort? If you are unsure, we recommend choosing a Weighted Blanket with low pressure, about 6-8% of your weight. If you think you need more, try a medium pressure Weighted Blanket, about 9-11% of your weight. If you like more weight you can choose a Weighted Blanket that is 12-13% of your weight. NEVER EXCEED 15%! OFFERING A VARIETY of sizes and weights we have something for everyone: Small 48"x30", Medium 58"x41", Large 72"x42", Extra Large 80"x58", Deluxe Small 52"x40", Deluxe Medium 66"x42" and Deluxe Large 76"x50". Helps adults and kids with sleep problems. AS SEEN ON NBC'S PARENTHOOD. 100% product satisfaction is guaranteed. Filled with tiny sand like glass beads evenly distributed throughout. It looks like a normal blanket, so no one will realize it is a weighted blanket. Works through induced pressure on the body to produce a natural sleep aid and help the person relax, fall asleep faster, easier and for longer periods of time. AFFORDABLE All orders shipped next business day! (No shipping on Saturday and Sunday) No hassle returns. Weighted Blankets should never be placed over the head and are not recommended for children under 2. OUR WEIGHTED BLANKETS are custom made by hand and shipped next business day. You get to choose the color you want, making your Weighted Blanket fit you and your personality. Not only that, but you get to choose the weight too. All Sensory Goods' Weighted Blankets are made by men and women who are committed to character, children, and community in Arizona, USA. The blanket is measured at 42” x 72” is made with a flannel/fleece combination fabric designed to provide the wearer options, but it can be covered with a duvet cover if you’re not keen on either side. It is machine washable, but some washing machines may struggle to handle both the weight and the fabric and drying can be a challenge, so it may be better suited for the laundromat or for dry cleaning. Every weight is manufactured in the 42” x 72” size. It also comes in a variety of colors including navy, blue, denim, burgundy, tan, purple, forest green, and hot pink.